Good afternoon! Andrew and I just returned from a loooooong stretch of vacation. We were in Chicago (for both of us, it was our first time there) for 5 days and then Austin for 4 days. Both were restful, adventurous, and beautiful, but it feels good to be back home and back into a rhythm. I mentioned on my previous post that I would go further in depth with each of the 9 things I listed that I wish I would've done in my regular classroom with my gifted students. I am going to further explain #1 and #4 first as a starting point, and I think they go nicely together, since inquiry and exploration in science and social studies includes a lot of student voice and choice in content, process, and product. The following post is a bit on the longer side, but I wanted to make sure to provide lots of examples and explanations. Classroom with Mike: very little student voice/choice, and science/social studies time was a lot of direct instruction with very few inquiry components, if any at all. Mike was not given the chance to share how he wanted to meet a standard or choose what kind of product he would make to show his learning. Mike was not given the chance to give me feedback as an educator or propose possible changes that could make learning for him better-- I didn't know at the time the importance of letting my students do so. Mike had very little space for asking above-and-beyond questions that he could actually find answers to on his own. I did not set up our science and social studies learning to be inquiry and discovery-based, which resulted in boredom and detachment during lessons. Oh, if only I knew then what I know now. Student voice and choice is a hot topic right now in many educational circles. We are seeing it pop up everywhere. Our district had a passionate Twitter chat all about it in May that blew us all away. We are seeing how crucial it is that students are given a voice- the ability to speak up, be brave, ask questions, share ideas, give examples, communicate needs and desires, and provide feedback on how the learning is going. This feedback can include commenting on a teacher's teaching methods or practice, to how they would change something in the classroom, whether it be the set-up of the desks or the book project that was assigned. When students are allowed this freedom to speak up respectfully and share what is on their minds, teachers are allowed the opportunity to hear from the best critic of all- their own students. You see, our students are not just receivers of information or visitors to our classroom. They are to be the center, and they have a right to say when something could be made different for the betterment of the learning environment. That doesn't mean they bark rudely at you or tell you what you are doing is stupid, because that gets nobody anywhere. At the beginning of this past year, some students after hearing that they had this freedom to speak into what we were doing as a class used it as merely an opportunity to complain or comment without any back-up or alternative plan-- and when I would ask them how they could envision something better or to give specifics, they could not. We all quickly learned that feedback isn't feedback if it's just noise. From day one, it is important to model and practice with students how to ask specific questions, how to provide and share new ideas or ways to do something differently, and how to give teachers constructive and helpful feedback. Opening up that line of communication builds a level of mutual trust and respect that is out of this world. It empowers students to be the owners of their learning experiences. It empowers them and produces boldness and leadership, to allow them to take on learning with their own two hands. The teacher is a facilitator, a guide, a mentor, a coach, a scaffolder, there every step of the way-- but now the students are in charge of their own learning and excited about it. They have a say! They have freedom! They can work in groups or by themselves if they want, they can go to the bathroom or sharpen a pencil when they desire, they can show their learning by making a movie or a model or a brochure, they can. Sure, there may be times where you as the educator know what is best for them and give them certain parameters-- you come to know when these times are; for example, the child who never works alone and always with others, or the child who wants to make a second 3D model that week and hasn't even finished their first-- you tend to pick up on these patterns and intervene when it is fitting. But when it comes to the learning process, there's not a lot of can't's that should be present anymore. With all children, especially gifted learners, they need this freedom. They need to be allowed a voice and choice in how they learn. Not just receivers of what we give them, but creators, doers, thinkers, makers, dreamers, full of ideas and possibilities. More on student voice and choice in content/process/product throughout the next several paragraphs, but I want to take a moment and talk about the importance of science and social studies. The first has to do with the way the world works around us, and all the things in it. The second has to do with the way communities and people work together, and how it has been done and how it has evolved and changed in our appropriate communities and the world over many years. When you boil it down, science and social studies teach us how to better understand our world- so they are super important! These are often subjects we skimp on (or skip completely) due to the nature of the fact that reading and math are so foundational and necessary, plus due to the fact that our students take standardized tests in these subjects sooner in their educational careers. So we spend little time on science and social studies or we try to integrate them into our ELAR block, but it just makes me sad that these subjects often get the shaft. To do science and social studies REALLY well, you can't just read a book about it. You can't just read a passage and answer comprehension questions about it. You have to incorporate inquiry- the process of starting with questioning, then walking through exploration, experimentation, and discovering answers to your questions along the way. You also have to incorporate *wonder* in science and social studies instruction. "I wonder how our life is different today because of historical figures and their contributions in the past? What would it be like without them?" "I wonder how objects in the sky move over a 24 hour period? How does the sky change?" It opens up so much opportunity for exploration and discovery. 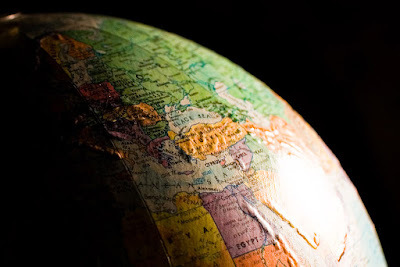 Here is how to use inquiry, wonder walls, research, and self-led experimentation in science and social studies while incorporating student voice and choice. 1) Gain Prior Knowledge. I should've done this so much more often with Mike and the learners in my classroom. It seems so simple, but when we as teachers construct an amazing lesson plan and then think about the what-if, "What if my students already know all of this and my planning time was wasted? ", we often can shy away from this very important step. This means that as a teacher, part of your job is to introduce the learning standard or target, and then gain what prior knowledge or ideas they already have coming into the unit. This is so important to do with gifted learners. They often come in already having the knowledge and having mastered the standard before anything else is said. When you ask what they already know, they can sometimes be an encyclopedia of information. My students often times know more than me, and I have learned to be okay with that! When I asked them what they knew about magnets, for example, I gave them about 3-4 minutes to write down their thoughts on sticky notes and post them to the board. They have a class number, so they would write their number in the corner so I would know whose was whose. After reading them all, I quickly realized which of my students already knew everything we needed to know about magnets- that they can push or pull objects, attract and pull objects made of iron, repelling/pushing happens when two similar poles are put together, and pulling/attracting happens when opposite poles are put together...and so on and so forth...and I laughed and realized that if I had made them sit there through a week's worth of magnet books and videos and lessons then they would've been bored and poor behaviors would have started to pop out and they would've been trying so hard to move on to something new. 2) Create a Wonder Wall. Whether a child knows everything there is to know about Abraham Lincoln or types of energy, there is always more to know or wonder about. Allow your students to wonder and ask new questions! These questions can be ones they can research or find out as you go, or they can be ones that turn into self-led experiments that are performed over a longer period of time. So, we gained some prior knowledge- what do we already know about plants and their parts? After finding out what my students knew and didn't know, I then knew how to go from there. As we would continue in our plant unit, the ones who didn't know would simply be the ones who I watched more closely as we engaged in the exploring and discovery pieces-- were they picking up the information they needed, and were they discovering it on their own? When they researched, were they finding answers? If they weren't, then of course I could do some one-on-one instruction with them or small grouping. 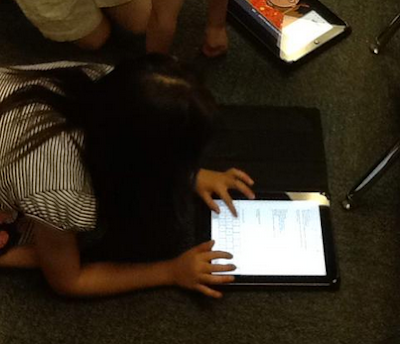 Then we all started to ask more questions-- this takes us into choice in content, what the students learn. Students often want to learn so much more, if we let them and get out of the way. If after generating prior knowledge you have students wanting to know more and go beyond the standard, you begin a wonder wall. ALL students can participate in a Wonder Wall, even the ones who don't have the basic content mastered yet. Wondering creates opportunities for learning, ones that we as teachers may not have even imagined. Creating a "Wonder Wall" is easy-- this can be at any space in the room. It can be a bulletin board; it can be a poster board you laminate and can put up or take down; or even a section of your white board. A Wonder Wall is most effective when it is always available, so that students can use post-it notes and jot down a wondering at any time during the day to stick up there and work with later. It is wonderful because whenever a child has a question they are wondering about and we may not have the time to go deep into it at that moment, we can all say, "Wonder Wall!" and the child can happily, excitedly go write it down and stick it up on the board to be explored at a later time. It is helpful because it doesn't dismiss the above-and-beyond questions, and it promises students that they can find out the things they want to know and will be given time to do so. They can explore their questions during an RtI Block or as a fast finisher activity, or during independent study-- you will find the time. However, you can be intentional with what the questions will be used for-- will they be a simple search one day on KidRex.org (a kid-friendly search engine), or will the questions be turned into experiments or independent study? 3) Self-Led Experimentation. So with plants we asked- What do plants need to survive? What does a seed need to germinate/sprout? (These first two questions I generated for class-wide experimentation.) Then they came up with the rest: Can seeds grow without any oxygen? How much space do seeds need to grow? How much soil do seeds need to grow and survive? If you give a plant too much water, will it die? We made hypotheses and predicted what we thought would happen if we tested any of these questions. We then set up inquiry-based experiments that the students chose- this is the process of learning the content they want to explore, and they chose how they wanted to do it- and their experiments were all based on one of the questions they asked on the Wonder Wall. They got into teams, told me the materials they needed to perform their experiments, used proper science tools, set their experiments up and put them in an area of the room by a window, or perhaps in a closet, if they were testing the effects of no sunlight. Next to their experiment they wrote their Wonder Wall question on an index card and propped it up next to the experiment, so all would know what the experiment was testing. 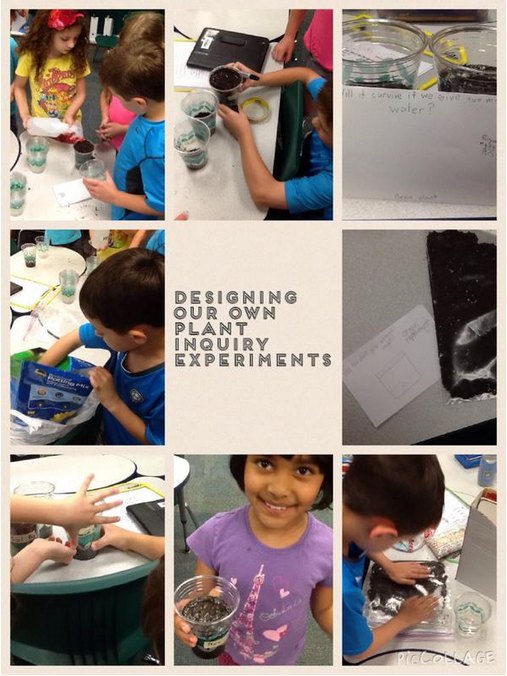 As we watched and observed these plant experiments, taking notes and recording what we noticed and new learning (my students couldn't believe that seeds only need water to germinate/sprout-- nothing more-- it was on many of their "top things I learned in first grade" lists), we dove into the plant parts and compared them to one another in each of the several experiments going on. After the two weeks of watching, observing, and recording what we noticed, we shared our findings to one another in our teams-- what we had discovered, if our question had been answered or if there was further exploration to do. My students loved this part because they were in charge of their question, their experiment, and their discovery-- they were the scientists, and I was the facilitator on the side. They owned it! 4) Research. 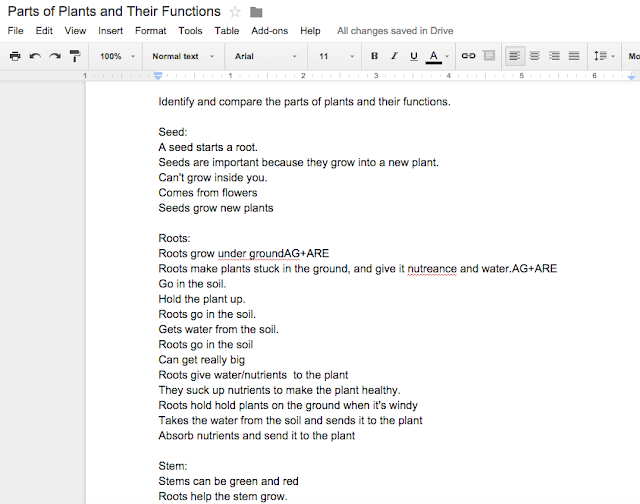 I asked how else we could find out information about plant parts and their functions, so students decided to research in teams (more process decisions- how the students want to learn) by using various web sites and videos explaining the parts of plants and their functions. They asked if we could use a class shared Google Doc to type down notes about each plant part as they found information. Some asked if they could just take notes on post-its, and others in their science journals --> more choice in process. This is another area you can differentiate in- the process of how children learn something does not always look the same for all the students in your class. While some students may feel comfortable and ready to go and research on their own, some are not-- and this could be a time where when others are independently researching, you can pull individuals or small groups to research together or to do a mini-lesson or reteach. It is important to provide choice in this way, even for gifted students, because sometimes they aren't ready or willing to go learn on their own in various cases. Sometimes they want you to teach them something directly, and that's ok! 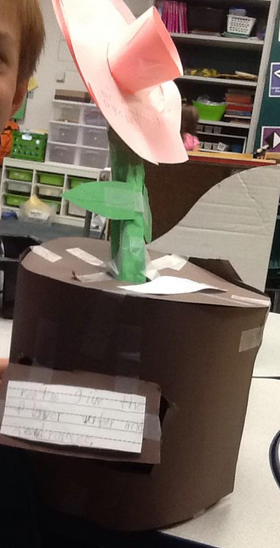 5) Assessment/How Students Show Their Learning and Understanding: Along the way, students created different products- ways to show their learning of plants and their parts. There are so many ways students can show learning along the way of course, and you can do continual formative assessment as you work through the study. However, as a summative (in lieu of a paper/pencil test) you can often ask students how they want to show you that they've learned. Sometimes they can just orally tell you. Sometimes you can just pull them one-on-one and them show you they know. But sometimes, they want to come up with something created and original- hence, a product. Students started their plant products at the beginning of the unit as opposed to at the end of the unit. 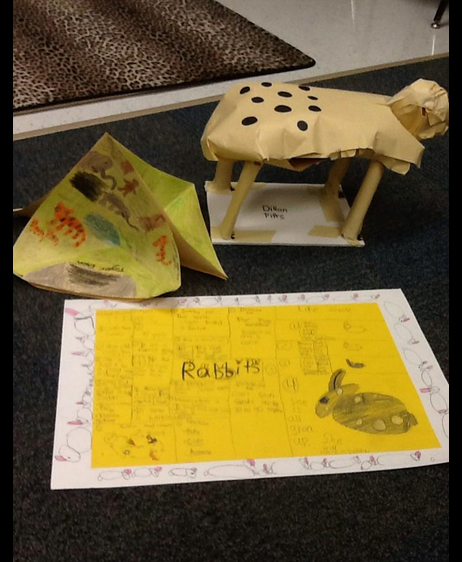 They updated their creations and worked on them as they learned and gained new understandings. This allows the students time to actually create a sophisticated product, instead of cramming it in at the end of a study. (Note: If I were to do it again, maybe we could've made this into some sort of PBL with an audience, but I don't think it is necessarily needed here. When you incorporate inquiry and self-selected experimentation and research, it can be very real-life and real-world to younger children.) They chose their own products, from creating life-size plant models to posters to books to digital products, labeling parts and describing their functions. Allowing choice in product is so important for gifted learners. They often have ideas of how they could show their learning, but we can limit them by always providing the means. From the beginning of the year, I slowly teach one product at a time. I started out last year with PicCollage to make collages with text, then recorded products such as Doceri, ChatterpixKids, Shadow Puppet, or iMovie. 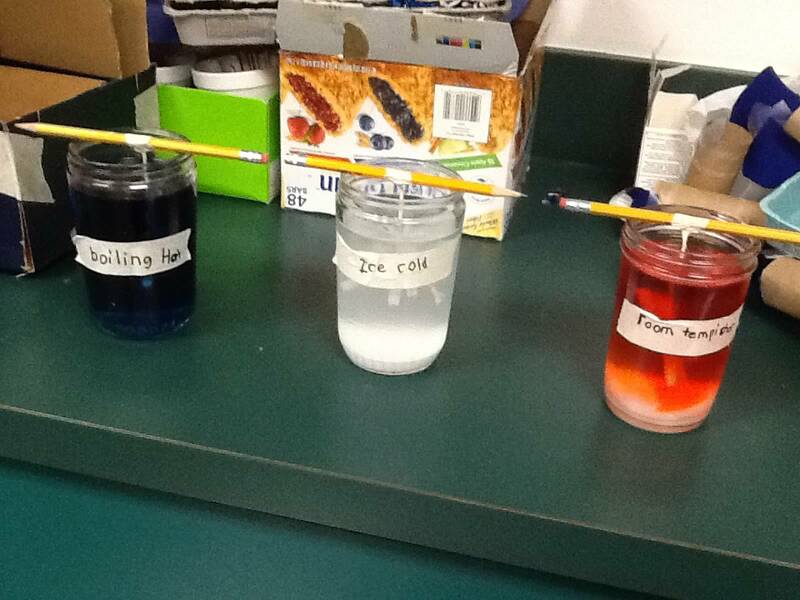 After introducing these, students already have a good amount of choice in their products early in the year. No digital tools? No problem. Introduce other ones at first, like a poster, a foldable, or a book. You can add additional product choices to your students' tool belt as you introduce them, and by mid-year, they have a wide array of products: advertisements, poems, iMovies, collages, posters, Popplets (digital webs), brochures, dioramas, models, Important Books, comic strips, and more. You can even have a list of these with visual aides for children so that when the time arises for them to choose, they remember what they have to pick from. Product choice is also super helpful with any student. I have a twice-exceptional student who struggled with writing on paper, but when he was allowed to explore other ways to show his learning, he blossomed. If you are used to a 5E model when approaching inquiry- Engage, Explore, Explain, Evaluate, and Elaborate- you can find this flow in the above approach. Engage/explore often go together in generating prior knowledge and wonder wall questions and in the experimentation/hands-on activities. Explain/Evaluate occur as students are learning from their hands-on experiences and teachers are providing understanding as they go, as well as through research and study of the content along the way. Evaluation is occurring every step of the way because you started with what your kids knew or didn't know yet, monitored and gauged their learning through observation and seeing their notes and journals, and also through the products and ways they show their understanding throughout. Elaborate really goes well with the Wonder Wall questioning and experimentation-- because a lot of those questions and experiments/studies that come from them are going above and beyond the learning standard anyway. So...who's ready to do some science right now? Because after typing all of this out, it's making those parts of my brain click wildly! I hope that this post has provided some clarity on #1 and #4 in my list. 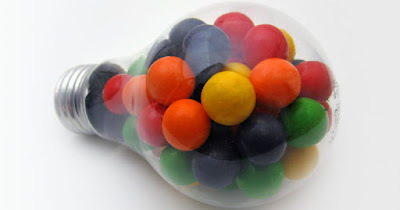 There are other examples or ways that we included the components of inquiry and of student voice and choice in the classroom, but this post is already packed full enough. Feel free to ask any questions or share ways you've done these things in the past. *Note #1: It is really helpful to find learning standards that go together so that you can reach all of them within one "unit." This is the approach PBL takes as well, to clump those together (cross-curricular as well!) so that you're not doing this entire process for one lone standard. *Note #2: I also want to say that this was a year-long process for me of learning how to do these things well. At the beginning of the year I was afraid to let go of all my teacher-control, and I hadn't quite figured out how to best approach science from an inquiry standpoint. But by the end of the year, I felt that my students had helped me somewhat figure it out. Next year we will continue to work on these things and find our flow as a new class, but I am excited that we had this past year full of wondering! Dear Withney, have you already published #5 to #9 ? If so, could you point me the link? I have being unable to find it here. If no, we are expectative to learn more about this wonderful innovation at classrrom. Thanks for your work!